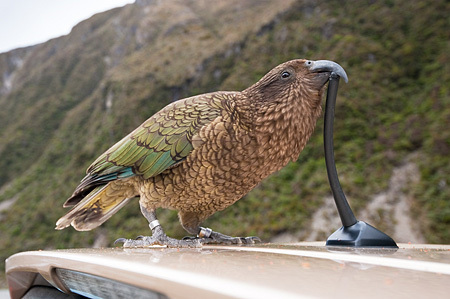 British conservationist, photographer and presenter (and all-round good-guy), Mark Carwardine, is once again in New Zealand undertaking a whistle-stop tour of some of the best wildlife attractions the country has to offer. Well-known for inspiring the sexual advances of another conservation hero – Sirocco the Kakapo – Mark is here to put New Zealand on the map as a wildlife destination for tourists coming from the UK. 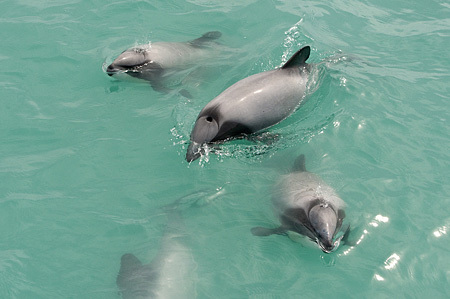 His visit will highlight our ‘Small 5’ (as opposed to Africa’s ‘Big 5’) – species that tourists can expect to see on a two-week visit – Hector’s dolphins, tuatara, kiwi, kea and yellow-eyed penguins. I caught up with him this week when he was in Akaroa to meet and photograph our very own Hector’s dolphins. Meeting at DOC’s Akaroa Field Base in miserable southerly weather, the day did not appear to brim with photography opportunities. Mark, Area Manager Bryan Jensen, Ranger (and boat captain) Derek Cox and myself all set out through the clouds and surf to the head of Akaroa Harbour to see if we could find the, often elusive, dolphins – and we were not disappointed. As the sea became rougher, the dolphins flocked to visit the only boat game enough to be out in the conditions. Groups of between two and six Hector’s would surf the waves as they rolled towards us, ducking under the boat at the last minute and then turn around to repeat their fun. Frustratingly, despite this brilliant display, it appeared the weather was not going to be so cooperative and driving rain soon set in making photography near-impossible. Thrilled by the antics of these rare dolphins but thwarted by the southerly, we were forced to head back to shore where we said goodbye to Mark who’s next stop was Wilderness Lodge in Arthur’s Pass to meet more friendly New Zealand locals – kea. It was a pleasure to help Mark with his project and hear his conservation stories. For those of you not already doing so, I would recommend you catch up with the latest news from his travels by following him on Twitter. *Mark took this photo of Hector’s dolphins in better weather on Sunday when he went out with Black Cat Cruises. We were sad to hear from him that there were several jet skis getting far too close to the dolphins and not complying with the guideline for sharing our coasts with marine mammals. Please make sure you don’t take advantage of our friendly marine mammals and let them come to you.